On My Lefthand Corner: (Up Movie by Pixar) Up, Up and Away! (Up Movie by Pixar) Up, Up and Away! Awesome movie! The best I've seen so far in 2009. Up proved so much more than I hoped it would be. It seemed at first like just a children's story of a flying house off to a magical adventure. But soon I found out that it touches adults in a very special way. It's about love, living your dreams, and finding your own paradise. Pixar rules! They really make great animation with always a wonderful storyline to match. Carl and Ellie are a couple who dreamed of setting foot on Paradise Falls in South America sometime in their lifetime. But there were hindrances along the way. Many years passed and they grew white hairs on their heads already, and their knees easily shook. Ellie later on passed away. Carl was left by his lonesome and wallowing in depression. Ellie's death looked like the end of their dreams. It didn't come to fruition. But one day he vowed to pursue their joint dream of living in Paradise Falls. And so he flew his house attached to a thousand balloons. By some accident, a boy named Russell was on Carl's porch when the house lifted from the ground. Little did Carl know that Russell will play a big role in making him realize a lot of things about himself, his wife and the world. We see both Carl and Russell progress in their own ways as they shared that trip together. At first, we saw their personalities colliding. Russell was young and very talkative, while Carl was old and preferred to keep to himself. They had different goals. Carl wanted to reach his ultimate destination, while Russell was more concerned on helping the captured bird which he named Kevin. But later on they learned to be interdependent and understood each other more. Probably the most touching scene in Up is that of Carl who leafed through the scrapbook of his late wife and it unfolded before him photos of them sharing many wonderful moments together at different stages of their marriage. At this point, Carl comes to the realization that his wife lived a full life after all. Ellie didn't need to go to South America to see Paradise Falls. She was happy with her own paradise of a happy marriage with him. Every moment spent with Carl was paradise. Before she died, she expressed her deep love for her husband by telling him to live his own adventure. And this was the turning point for Carl. Suddenly, his trip began to take a whole new meaning. I watched the movie in 3D and it was so worth it! Never mind that my 3D spectacles were big and kept falling. Had to push them up in place every so often. 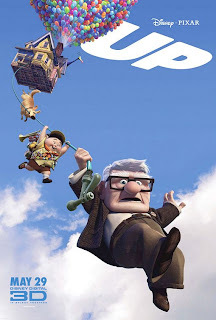 Up will surely strike the cords of the heart of every viewer. Anyhoo, this movie reminded me of a young girl. I just read it on the news. I'm not sure though if you've heard about her. This young girl had cancer and begged from Disney to let her watch the movie 'Up' in her house. You see, the girl was so weak and frail that they had to carry her in a wheelchair. So watching the movie in the big screen was impossible for her. The girl's family didn't expect this but Disney sent one of their men to the girl's house and let the girl watch the movie 'Up' in their own TV. He also gave the girl some souvenirs from the movie. The girl died seven hours after watching the movie. According to the girl's mother, the girl was so happy after watching the movie. ^OMG, my bad. It wasn't Disney after all. It was pixar. Watched this in 3D at SM The Block. It was worth it. It was not just about the 3D effect. The movie had a good story. Two thumbs up to Disney! Love this movie! ^^ I (almost) cried.